Many people have heard of Perry Rhodan as the most successful SF series of all time but don’t really know what it’s about. Could you give a brief summary of Perry Rhodan for someone who knows nothing other than the name? If you want to approach Perry Rhodan, you must first understand that it’s not serious literature, but easy entertainment. The novels are often sold in train station bookshops by the side of love and hospital romances. Most of the novels consist of dialogue – the reader has to work out the story behind the story itself. As Perry Rhodan is about to reach issue 3000, it’s difficult to summarise. To compress it extremely: Perry Rhodan starts as the story of the peaceful unification of mankind, the departure of our species into the Milky Way and the pacification of the galaxy. The middle part of the saga deals with the decline of the Solar Empire, the re-emergence of mankind and the first contacts with larger cosmic powers. The current tale reaches metaphysical realms – humanity learns the forces behind the cosmic powers, and begins to intervene in cosmic structures. Perry Rhodan started in Germany in 1961, the height of the Cold War and the year the Berlin Wall was constructed. How did the origin of the series, and its development before and after the unification of Germany, reflect the zeitgeist of the country during the 40 years of colossal change up until the beginning of the 21st Century? Perry Rhodan is a commercial product that has to take the sensitivities of its audience into consideration. The prevailing zeitgeist can only be viewed retrospectively. The reunification of Germany did not have a great impact on the content, since the narrative structure had already changed in the mid-seventies with the inclusion of younger authors in the team. Until then, the narrative structure was rather that of the classical science fiction of the fifties with all its military excesses. Afterwards it became extremely pacifistic. In the eighties, economic issues became more and more important, which were supplemented by cosmological themes in the nineties using the new knowledge gained in astronomy. There have been a few attempts to translate Perry Rhodan into English but these were unsuccessful. It seems that Perry Rhodan’s success is very much focussed in Germany. Why do you think this is? 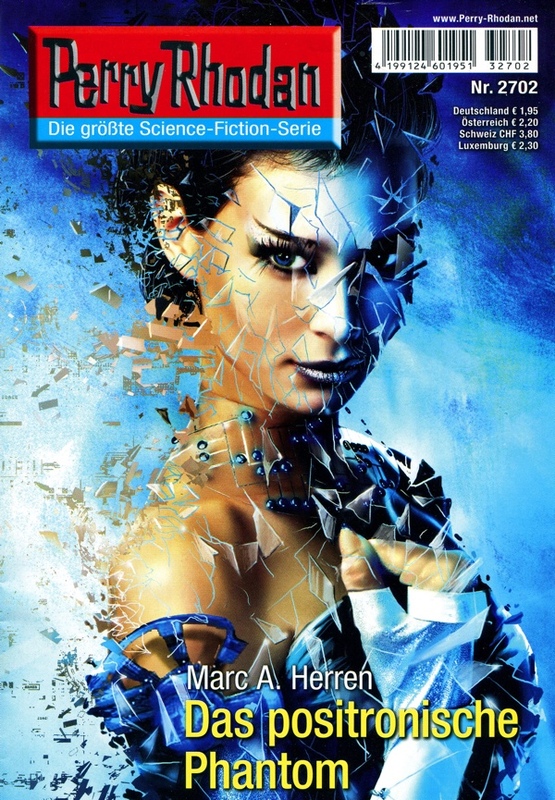 What is it about Perry Rhodan that makes it so successful in Germany, and less so elsewhere? 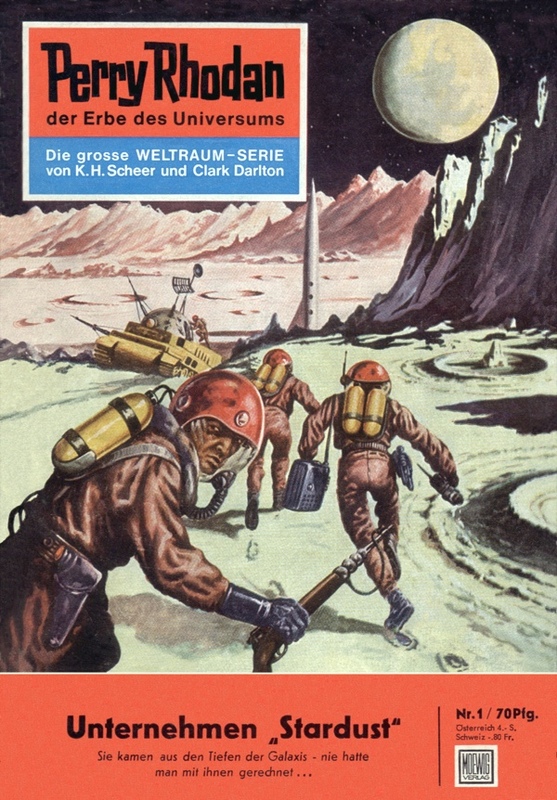 Yes, Perry Rhodan is a special German thing. It is helpful to understand the situation of Germany in the 1960s. The small remainder of a once great empire, half of them under communist control, trying to heal wounds and offer millions of displaced persons a new home. Against expectations economically successful, but threatened as a designated battlefield of the Third World War with complete atomic destruction. In this situation it needed a glimmer of hope, even if it was in the form of an American Messiah. This person, Perry Rhodan, gave us a dream, a hope that it is possible to end this madness of the power blocks and to see, as a united humanity, the miracles of the universe. Perry Rhodan teaches, especially in the later editions, extreme tolerance and indispensable pacifism. Maybe other countries can not follow this dream yet, but some still have like Brazil, France, Japan, Netherland or the Czech Republic. 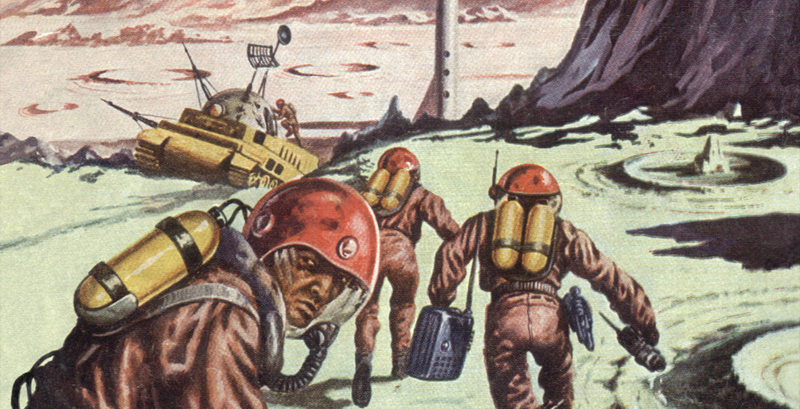 Is Perry Rhodan influenced by the changes in mainstream science fiction and fantasy? If so, how? If not, why? Does it influence mainstream sf/fantasy? Not necessarily. Perry Rhodan is more influenced by the generational change in the teams of authors. The great frame of action has been established for decades and has been pursued consistently since then. In other series however, you can thoroughly see borrowings from Perry Rhodan. In 1964 the Posbis appeared, bio-mechanical robots with their cubical fragment spaceships – models for the Borg from Star Trek? The SOL, a long-distance spaceship from 1975 trying to find the way back to the Milky Way over many million light years – Starship Voyager? Are Stargates taken from Perry Rhodan Transmitters? On the other hand, the mutants from Perry Rhodan are nothing more than a copy of American superheroes. Also the ships of the Cosmic Hanse have a strong resemblance to Imperial Star Destroyers from Star Wars. That these series influence each other more or less is normal. Following on from Question 2 above – much science fiction is used to address issues in modern society (e.g. Battlestar Galactica and the Iraq War, The Handmaid’s Tale and the rise of the religious right in the US). Does Perry Rhodan follow the same pattern? Would you describe it as political and if so where does it sit in relation to contemporary German politics and society. At first glance, Perry Rhodan is not political, because it is designed as entertainment. On closer examination, however, one can still perceive a critical view of the society of the time. For example, the Aphille Cycle, which began in 1975, depicts a humanity that loses its emotions. Families break down, sexuality becomes a secular incident, small children are given over to state education institutions, and seniors who are no longer serving society disappear in Stummhauses (dumb houses). All this is a silent and subtle reminder of the social changes in the seventies, the break-up of large-family structures, and the changing treatment of children and seniors. 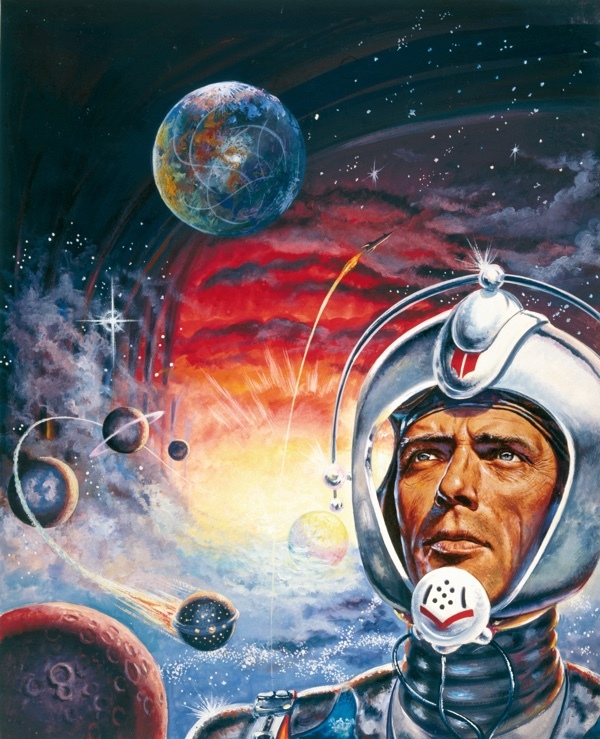 What do you think is the best Perry Rhodan story of all time? Can you give us a couple of summary sentences of the plot and tell us why you think it’s so good. I personally like the section between volume 700 and volume 1000 very much. The Laren of the Council of the Seven conquer the galaxy and smash the Solar Empire. The Earth and the Moon are taken to safety with the help of a solar transmitter, but this fails and the Earth re-materialises millions of light years away in a maelstrom of the stars – a galactic umbilical cord between two diverging galaxies. As the story unfolds the Superintelligence ES absorbs the consciousnesses of humans, in order to protect them from destruction. 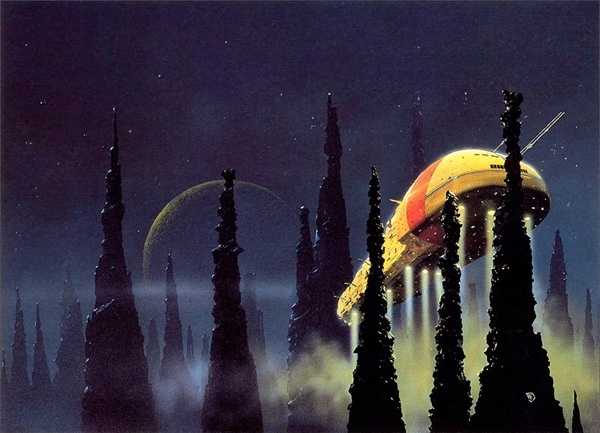 Perry Rhodan decamps from Terra with the long-distance spaceship SOL to find the Milky Way. Through the course of the narrative, the cosmological structure of the series is increasingly revealed. and the Superintelligences are divided into powers of chaos and order. Beyond them are the Cosmocrats, greater intelligences, who exist on different planes. The interesting thing about this section of the Perry Rhodan series is the change from classical science fiction with its space battles and extraterrestrial civilizations to cosmological science fiction, which focusses on the structure of the universe and the motives of the evolutionarily more developed non-living intelligences behind it. Science comes to the fore. If you were going to sell Perry Rhodan to English audiences what would you tell them? Don’t! This is the severest German propaganda! Anyone who reads this will turn into a miserable pacifist immediately, declaring tolerance as his or her new religion. Will we see Perry Rhodan in English again in the future? Since I can’t answer that, I addressed this question to the chief editor of the Perry Rhodan series, Mr. Klaus N. Frick. Unfortunately, due to the many publications in the Perry Rhodan universe, they are not able to publish it themselves in English. Nor is this likely to change in the near future. I think this is a great pity, the last release in English was the Lemuria series . I believe if an English investor would be willing to bear the financial risk of translation and publication, the rights holder would not block it. Hi there from Bavaria, Germany. Since apprx. 30 years I read this SciFi-series and I still LOVE it. In fact it´s a pity PR isn´t translated to english since a long long time. I´d believe there´ll be many readers who would enjoy this epic series. The fact that English translations did not succeed does however not mean that its purely a German thing, the series also does quite well in my country, The Netherlands, as well as to my best knowledge in Japan, Brazil and France, excuses if I might have missed some other countries. I enjoyed your article. I am an American Perry Rhodan fan and collector, and subscribe to the weekly series here in the US. I scan the issues and use a translator to read it. I am presently reading the current issue [#2938]. There are usually 3 or 4 different story lines going at the same time, until the end of the current cycle. Cycles are usually 100 issues, but there have been several 12 issue mini-series. The saga has been rebooted through a paperback series title Perry Rhodan Neo, presently through #162. I would assume that any major english translation in the future would start here. ‘Most of the novels consist of dialogue – the reader has to work out the story behind the story itself.’ – Very far from right; there is as much narration as dialogues, if not more. Përry Rhodan is not theatre nor soap. Here above Joachim Stingl describes it as ‘epic … magnificent, fascinating, cosmologic’. How could you achieve this over nearly 3000 episodes without really telling a story? Anyway, thank you for speaking about Perry Rhodan. I also agree with Kelly above that there is actually more narration than dialogue in a typical Rhodan story. The early Rhodan novels clearly show the influence of Asimov in both the techologies espoused and the writing style, so he is a good point of comparison for those SF fans who have not read PR. I also take issue with the statement that the English translation wasn’t successful – Ace Books published PR in English for 10 years, that is a strong track record of success. If it wasn’t successful it could not have lasted for a whole decade in English. 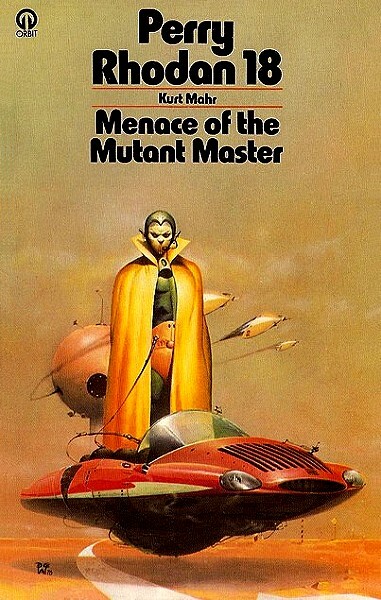 The English translations were cancelled because the new publisher at Ace didn’t like the series and thought it was “too juvenile” – which the translator and editor both felt should have been a SELLING point, but at the time the focus of American publishers was on pushing SF as something for the “adult” buyer. These days, with the huge proliferation of young adult novel series, PR could be better marketed in English alongside series like Alex Rider. The big problem for publishing the series in English is twofold: (1) The long and convoluted (in comparison to English) sentence structure of German makes it a cumbersome language to translate, which means you need a highly skilful translator to make it work in English; (2) The German publishers have historically simply not given the necessary levels of support and cooperation to English language publishers. Also for the record the mutants in Perry Rhodan predate American mutant superheroes like the X Men. I recently came across a set of the old ACE books and started reading them. They are ton of fun though obviously dated. This lead me to reading some of the Perry Rhodan NEO books via Kindle, to Calbre, to Google Translate, and find them to be excellent Science Fiction. Given the dearth of new science fiction being published right now (almost everything new these days seems to be Epic Fantasy and Vampires) it’s very unfortunate the NEO books at least, can’t find an English translator. 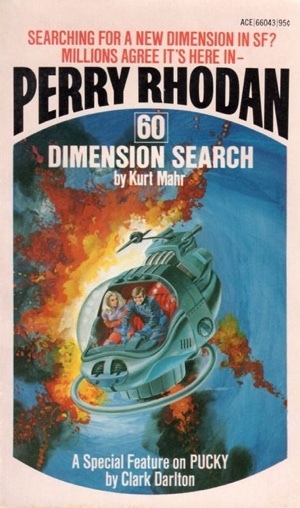 From the moment I came across Perry Rhodan, in an old dirty cardboard box on the basement of the original NYC Forbidden Planet store; it was a love affair. I also found many old Conan novels, that thrilled me no end. But Perry Rhodan: Peacelord of the Universe, was my true thrill. So many stories to read, but unfortunately beyond my reach due to my inability to read German. Either I learn German, or wait till computers with acceptable levels of AI, to enable a decent translation from any language, with all their nuances. It will come, and when it does, no written material in whatever language we may find, will be beyond our reach. Kevin Richardson where did you get all the books from. We have 1-39 and have never managed to get any others. Can you explain the process and software you use? Can you explain your process, please? I have read SF all my life and I have to admit while I have seen the paperback versions here in Canada I have never picked any up. While I realize it will not be the same experience as the German version, I am definitely going to purchase some the next time I am at the used bookstore. Your post really intrigued me, I was quite taken with the longevity of the series and the changes in subject matter it has gone through over the years. I enjoy seeing how SF both morphs and yet remains part of a continuum as new scientific and technical discoveries are made, different literary techniques are applied and most importantly as new voices enter the field. It’s also possible to buy issues in epub from Amazon.de, which you could then Google translate.